I’m afraid that I had to fly to Ireland unexpectedly today, and just had time to solve today’s puzzle and write up this abbreviated post in between flights. I will catch up just as soon I can when I land in the Auld Sod. Apologies for the inconvenience. 10 “Well, well, well!” : OHO! 22:15 no errors. 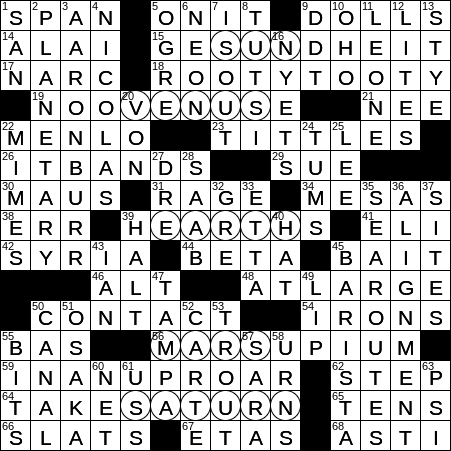 I am still amazed how someone can create a puzzle and align words like sun, Venus, Earth, Mars, and Saturn and make everything fit across and down. I guess it’s like a magicians secrets…. Once you learn its not so hard but for now it still blows my mind. Tittles… learned a new word today. Jots and tittles. In the bible. Darn! 30a looked more likely to be MAUI then MAUS so I changed 4d to NICOLAI. For me to get this close on a Wednesday is very rare, so I agree it was very easy. Guessed TITTLES. 5 Planets? We’ll Bill was in a hurry. 9:52, no errors. I, too, learned a new (and non-titillating) word today. @Anonymous II: A planetary alignment does not require all eight planets to be represented. A ‘five planet’ alignment is very rare. @BruceB … I had exactly the same thought when I saw Anonymous II’s post, but then I realized that the theme entries include the sun and four planets, rather than five – a minor glitch in Bill’s post. @Bill—-May the luck of the Irish be with on your trip, Bill. I made the very same mistake that Terry Stewart made and for the very same reasons. The last letter of the NICOLAS/MAUS cross sure seemed like it would be an “I” to me. Otherwise, I agree this puzzle was very easy for a Wednesday. Enjoyed this one a lot, but didn’t find it all that easy. It’s a pretty solid Wednesday, with elements of surprise. Deserves praise, IMO. There is also Menlo Park, NJ where Thomas Edison had his laboratory. I made the Maui mistake too as well. I don’t understand “psi”answered “letter after ‘x’. Would someone please explain. I tried to learn from these crossword puzzles, Just get the right answer. I also don’t understand the Answer “step” as The answer to “flight park.” Would someone mind explaining?